Bonds are commonly referred to as fixed-income securities and are one of the three main generic asset classes, along with stocks (equities) and cash equivalents. Many corporate and government bonds are publicly traded on exchanges, while others are traded only over-the-counter (OTC). A government bond is a bond issued by a national government, generally with a promise to pay periodic interest payments and to repay the face value on the maturity date. Government bonds are usually denominated in the country’s own currency. Another term similar to government bond is “sovereign bond”. Technically any bond issued by a sovereign entity is a sovereign bond but sometimes the term is used to refer to bonds issued in a currency other than the sovereign’s currency. If a government or sovereign is close to default on its debt the media often refer to this as a sovereign debt crisis. The first ever bond issued by a national government was issued by the Bank of England in 1694 to raise money to fund a war against France. It was in the form of a tontine. The Bank of England and government bonds were introduced in England by William III of England also called William of Orange who copied the 7 Dutch Provinces approach of issuing bonds and raising government debt where he ruled as a Stadtholder to finance England’s war efforts. 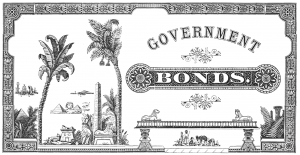 Government bonds in a country’s own currency are sometimes taken as an approximation of the theoretical risk-free bond, because it is assumed that the government can raise taxes or create additional currency in order to redeem the bond at maturity. There have been instances where a government has defaulted on its domestic currency debt, such asRussia in 1998 (the “ruble crisis”) (see national bankruptcy). Currency risk is the risk that the value of the currency a bond pays out will decline compared to the holder’s reference currency. For example, a German investor would consider United States bonds to have more currency risk than German bonds (since the dollar may go down relative to the euro); similarly, a United States investor would consider German bonds to have more currency risk than United States bonds (since the euro may go down relative to the dollar). A bond paying in a currency that does not have a history of keeping its value may not be a good deal even if a high interest rate is offered.